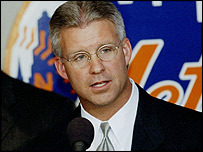 It was five years ago today that the New York Mets fired their GM Steve Phillips. At the time, the Mets were in last place with a 29-35 record, 15 games behind the division-leading Braves. They had finished last the previous season as well, and had brought in Art Howe and signed several free agents in an effort to turn it around. Wilpon said all the money he’s spent on the team doesn’t ensure success. “We’ve learned that painfully,” he said. The Mets (28-35) got off to a bad start and never recovered, hurt by injuries and inconsistent play by their stars. I’m not suggesting anything here, just bringing it up. Ironic, though, isn’t it? For the second consecutive day, the Mets wasted an outstanding effort by their starting pitcher. Johan Santana pitched seven shutout innings, allowing only three hits and three walks, striking out ten in a 115-pitch effort. The only thing Santana did wrong was not pitch the final two frames. Instead, the “setup” relief crew allowed Arizona to score two runs in the eighth, then closer Billy Wagner blew his third straight save opportunity by allowing another deuce in the ninth. The Mets had a golden opportunity to salvage the game in the bottom of the ninth, as Jose Reyes led off with an infield single and was sacrificed to second by Endy Chavez. David Wright then ripped the game-winning hit down the third base line, but Augie Ojeda made a diving stab, holding Reyes at second and getting Wright out at first. Carlos Beltran was intentionally walked, and Carlos Delgado drew a walk himself to load the bases, and then Damion Easley smacked a grounder into the hole between shortstop and third to drive in the winning run for the second time of the inning. EXCEPT, shortstop Stephen Drew made a sparkling play of his own to stop the ball and make the throw to nab Delgado before he could slide into second. Aaron Heilman entered in the tenth and gave up a leadoff double to Justin Upton to start the inning. Upton was sacrificed to third, though it looked like batter-runner Jeff Salazar beat Heilman’s throw to first. Heilman then struck out Miguel Montero on a great 0-2, inside fastball for the second out with Justin Upton on third base, but the home plate umpire missed the call. Maybe it was payback for the out call on first base? In any case, Montero sent the next pitch into right field, deep enough to score Upton with the winning run. The Mets were so relieved that the Diamondbacks scored early in extras, they make three quick outs to make it easy for them to get to the airport. What else is there to say? The Mets were incidental winners last night, and followed it up with another emotionally devastating loss. The morale can’t be any worse, the team can’t sink any lower. My only hope is that Willie Randolph isn’t made the scapegoat, because he’s putting the players into position to win — but they’re not executing. It’s a matter of personnel, and the first guy who deserves to go — Carlos Delgado — happens to be on a hot streak and has been caught hustling a few times in the last few days. The Mets have entered a rut where they’re waiting to lose, rather than going hard after a win. Big win last night. Woo hoo. More like, darn lucky win. Was it me, or were the Mets waiting to lose the game before Carlos Beltran belted one out of the park? Anywho, ending a five-game losing streak is hardly cause for celebration. There are still issues with the Mets, and it goes beyond this year’s 31-33 record. As we’ve all heard from every media outlet, the Mets have been playing .500 ball for about a year now. Being mediocre for that long does not suggest future success. Gawd, where do I start? Let’s begin with Millar. I’m an advocate of bringing him, or someone like him (i.e., someone with a pulse) into the fold to shake things up a bit. It’s also nice that he’s a righthanded bat who can play both the OF and 1B. His advanced age is worrisome, but on the crotchety old Mets roster he looks like a spring chicken. Finally, it’s helpful to have someone else around the clubhouse who has actually won a World Series ring — not too many of those currently on the roster. Now let’s get to Tony Bernazard. If in fact it’s true that Tony B. is the reason the Mets aren’t hot on acquiring Millar, then by all means it’s a deal I want to see done PRONTO. Why? Because if Willie Randolph can be continually undermined for the team’s performance, then how about someone in the front office getting crisp slap on the face? Case in point: last season, the Mets are in first place, but the team is struggling offensively. The front office fires Willie’s best buddy and batting coach Rick Down, then assigns Howard Johnson and Rickey Henderson to “Willie’s” coaching staff. Of course, it’s not really Willie’s staff, since nearly every member was chosen and hired by the front office. When the Down firing took place, it sent a message to Willie: we’re in control of this team, not you. A year later, it’s pretty clear that the team’s .500 record has more to do with the batting coach — or any coaches, for that matter. The issue is clear to anyone who can see the forest from the trees that this team has a personnel problem. That established, who put the personnel into place? Omar Minaya, of course, but he’s not going to fire himself. The next man in line is Tony Bernazard, the VP – Player Development. Sandy Johnson, the VP – Scouting Director, should also be on the line, though I get the feeling that Johnson doesn’t have nearly the influence of Bernazard in the final decision-making process. Which if true, is strange, since Johnson is the one with vast experience in scouting and player evaluation, while Bernazard’s background is, well … I’m really not sure how a guy with his background gets a position of power. After finishing a rollercoaster career as a streak-hitting second baseman, Bernazard worked as a “special assistant” in the MLBPA. His next job was again a “special assistant”, this time to Minaya. Then all of a sudden he’s Omar’s righthand man, a VP in charge of Player Development. There are some serious issues with the Mets’ roster, there have been curious personnel moves recently (Abraham Nunez? ), and the Mets went into the season without backup plans for the fragile bodies of Moises Alou, Orlando Hernandez, and Pedro Martinez; with the idea that Mike Pelfrey was ready for prime time; and without acquiring a legitimate RH bat to spell Carlos Delgado. May I also add the fact we’re looking at three and a half more years of Luis Castillo at a less-than-bargain rate? Before Rick Down was sent packing (and I admit I was on board with the decision at the time), he at least had justification for existence on the staff. For example, he’d won World Series rings as batting coach for one of the best offenses in baseball, the New York Yankees. What is the justification for Bernazard? His claim to fame — and apparently the reason for his promotion to VP — was his “significant role” in bringing Carlos Beltran to the Mets. Well, number one, it isn’t hard to convince someone to play baseball when you’re holding a $119M offer in your hands. And two, many of us now think that paying Beltran marquee money to be a complimentary player wasn’t such a “coup”. Of course, it’s a lot easier to put the blame on the manager. And in fact, even if you don’t blame the manager, firing him just for the sake of change is the easiest short-term solution. Heck, there have been enough in-season firings that turned teams around in the past — Bob Lemon for Billy Martin with the ’78 Yankees; Jack McKeon for Jeff Torborg on the ’03 Marlins; Phil Garner for Jimy Williams with the ’04 Astros. The problem, though, is if showing Willie the exit doesn’t change the team’s performance, then Omar and his staff are next to go. Personally, I’d start looking more long-term right now, and make the front office accountable first. Band-aids can only stop the bleeding for so long — and this is a team with some large wounds. The Mets blew another one, then went into a coma, were lucky enough their opponents did also, and then finally recaptured a win in the lucky 13th inning. Mike Pelfrey had perhaps his most dominating outing as a pro, throwing eight full innings of shutout ball. He struck out 8 D-Backs in the process, allowing five hits and two walks on 112 pitches. He was removed after allowing a hit to Stephen Drew to start the ninth, and received a well-deserved standing ovation from the crowd. Right before the ovation, the crowd did all they could do to tell Willie Randolph he was making a terrible move by removing Big Pelf, but he either misunderstood the communication or ignored it, because he summoned Billy Wagner to the mound. Chad Tracy for the second out. Mark Reynolds then worked the count full, fouling off several pitches in the process, before sending the seventh pitch of the at-bat to deep left-center. The crowd, which had been on its feet and clamoring for a strikeout, fell silent in parallel to the ball’s downward trajectory beyond the fence. Billy Wagner’s face also fell, and the entire Mets team looked as though it received a collective punch in the stomach. I was lucky enough to have seats at field level, directly behind home plate, about 12 rows back (these SNY connections are starting to pay off), and I can tell you firsthand that the Mets looked like a deflated balloon from that moment through the next four innings. The batters were going through the motions, seemingly trying to get the game over with. Luckily, the bullpen held the fort long enough for Carlos Beltran to find the energy to blast a ball of his own over the fence to win the game. Once that bullet left his bat, the Mets dugout was suddenly electrified, and the 38 fans left in the stands shared in the jubilation. This team can’t continue to … believe this is the game Pelfrey finally puts it all together. If the players are reading the blogs and seeking to prove knuckleheads like me wrong, I’ll be happy to continue writing critical pieces. Whatever it takes to win, I’ll do it. Heck, I’ll change the name of my blog to “FootInMouthToday.com” if it helps. Got to see phenom Max Scherzer from an ideal view — just behind the umpire’s right shoulder. The kid can throw gas, but his mechanics scare me. He starts out smooth, but curls his throwing hand behind his back a bit and then comes forward with a violent release that jerks his head down. Every pitch he throws looks like it hurts, and I kept waiting for his shoulder to follow the ball to the catcher’s glove. I hope he can stay healthy, but with that kind of motion I fear he’ll tear something with regular work. Beltran drove in four of the Mets’ five runs with his two hits. Marlon Anderson drove in the other run. Aaron Heilman pitched two innings of scoreless, one-hit relief. I questioned the decision to bring in Claudio Vargas in the top of the 13th, as this made the third day in a row he’s appeared in a game — as he’s not been a regular reliever since 2004. Hopefully Willie Randolph doesn’t get all Jorge Sosa on him, and think he can pitch every single day. Since I had great seats, I got some decent pictures. That damn net, though, screwed up the focus on many good shots. Mets and D-Backs play the rubber match at 1:10 PM on Thursday, with Johan Santana facing Danny Haren. Should be another low-scoring game.